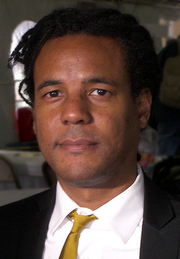 Colson Whitehead has 2 media appearances. Join us in the Community Room of Panera Bread in the Charleston Town Center Mall (Charleston, West Virginia) as we discuss our June read, The Underground Railroad by Colson Whitehead. Books are available at the Kanawha County Public Library - Main, just mention the Mall Book Group. Discussions are generally led by librarians from the Kanawha County Public Library. On one level, The noble hustle is a familiar species of participatory journalism--a longtime neighborhood poker player, Whitehead was given a $10,000 stake and an assignment from the online magazine Grantland to see how far he could get in the World Series of Poker. But since it stems from the astonishing mind of Whitehead, the book is a brilliant, hilarious, weirdly profound, and ultimately moving portrayal of the human condition. Wednesday, May 28 at 7PM BookPeople Presents Bestselling Author Colson Whitehead speaking & signing The Noble Hustle: Poker, Beef Jerky, & Death "I have a good poker face because I am half dead inside." So begins the hilarious and unexpectedly moving adventures of an amateur player who lucked into a seat at the biggest card game in town--the World Series of Poker. We're huge fans of Colson Whitehead's novels, (Zone One, Sag Harbor, The Intuitionist) and can't wait to hear him talk about his real life experience wheeling and dealing at the poker table in Las Vegas. The speaking portion of this event is free and open to the public. Tickets are required for the signing and only available with the purchase of a copy of The Noble Hustle from BookPeople. PLEASE READ: The speaking portion of this event is free and open to the public. Tickets are required to join the signing line at this event. Books & tickets are available for pre-order. Purchasing a book online automatically assigns you a ticket for the signing. There is no separate "ticket" item to add to your cart. If you cannot make it to the event, you can order a signed copy. Add the book to your cart and write "SIGNED COPY" in the comments field during checkout. We ship all over the world! "I have a good poker face because I am half dead inside." So begins the hilarious and unexpectedly moving adventures of an amateur player who lucked into a seat at the biggest card game in town--the World Series of Poker. In 2011, Grantland magazine sent award-winning novelist Colson Whitehead to brave the harrowing, seven-day gauntlet of the World Series of Poker in Las Vegas. It was the assignment of a lifetime, except for one hitch--he'd never played in a casino tournament before. In a world full of long shots and short odds, The Noble Hustle is a sure bet, a raucously funny social satire whose main target is the author himself. Whether you've been playing cards your whole life or have never picked up a hand, you're sure to agree that this book contains some of the best writing about beef jerky ever put to paper. Colson Whitehead is the author of the novels Zone One, The Intuitionist, John Henry Days, Apex Hides the Hurt, and Sag Harbor. He has also written a book of about his hometown, a collection of essays called The Colossus of New York. His work has appeared in the New York Times, Granta, Harper’s, and the New Yorker. A recipient of a Whiting Writers Award, a MacArthur grant, and a fellowship at the Cullman Center for Scholars and Writers, he lives in New York City. In order to have anything signed at a BookPeople event, a copy of the event book must be purchased from BookPeople. If you purchase your book from BookPeople in advance of the event, please save your receipt and present it at the event. Thank you for supporting Colson Whitehead & your local independent bookstore! Colson Whitehead is currently considered a "single author." If one or more works are by a distinct, homonymous authors, go ahead and split the author. Colson Whitehead is composed of 4 names. You can examine and separate out names.